To this day, I still can’t bring myself to watch Roman Polanski’s (supposed) 2002 cinematic masterpiece The Pianist. My father was Polish. He was a pilot with the Polish Air Force, who, having fought alongside the British, was shot down over Germany – where he spent a number of years as a prisoner of war. I mention this because I was raised within the trajectory of the Second World War; and from what little my father told me, I’m still left with the impression he must have witnessed many of the harrowing things depicted in Polanski’s film. That said, I’ve always retained a fervent interest in twentieth century Polish history, especially the war years, as they were so much a part of my upbringing. 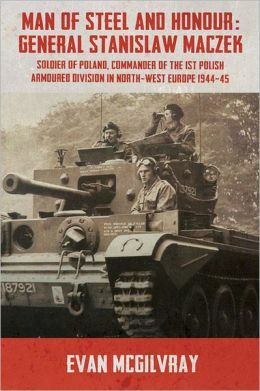 Hence, this review of Evan McGilvray’s Man Of Steel and Honour: General Stanislaw Maczek – Soldier of Poland, Commander of the 1st Polish Armoured Division in North-West Europe 1944-45. Its rather elongated title, does, in a round-a-bout way, give you a pretty good and succinct synopsis of the book. A book, which it has to be said, is a very worthy tribute to this most undervalued and perhaps least recognised of World War II commanders. A moot point that may in part have been due to the simple fact that he was Polish. Either that, or the seemingly fraught, veil of counter-closet politics; which, not only impinged upon many of the Polish Armed Forces throughout the war, but really did put many its commanders to unspeakable tests. Whether at Arnhem in Holland, Monte Cassino in Italy, or Normandy in Northern France, most fighting Poles, vehemently declined to politically rock the boat; even though, as many might argue, they had countless, countless reasons to do so. Maczek very much included. I found the above, historically illuminating to say the least, especially when further substantiated by the following: ‘’Maczek commented that when armoured formations were funnelled through a narrow corridor they were forced to make a frontal attack, which he considered to be the most dangerous procedure. Maczek was also correct in his assertion before the Polish armoured attacks on German positions that in the key areas of the Allied armoured attacks the German defensive system had been continuously strengthened, and once they were overrun it was obvious that these defences were deeper than had been expected’’ (my italics). The writing throughout a few of these 233 pages might come across as being a little dry, but the information it conveys needs to emphatically be placed in perspective. The prime subject matter is after all, military history, which perhaps on occasion, some readers might find a tad cryptic. And although McGilvray might not be Antony Beevor (not many writers on the Second World War are), he makes for a very edifying, as well concise and compelling writer. This entry was posted in Biography, History and tagged Evan McGilvray, General Stanislaw Maczek, Normandy Campaign, Polish Armed Forces during WWII, Polish Armed Forces in Normandy. Bookmark the permalink.